It all started when four immensely talented guys took on the stage and blew everyone away as they each competed on The Voice Belgium. After joining together to become the boy band sensation we all are obsessed with, the rest is history, and these brilliant and extraordinary guys known collectively as State Of Mind are now taking the entertainment world by storm in a way like no other boy band you have seen before. State Of Mind is destined to make history as one of the greatest boy bands the music world has ever seen. State Of Mind has and continues to make such a great impact in the lives of all of their fans through their outstanding music. Each of the band members: Sebastian, Jaxon, Shane, and Kyle have the most indescribable, raw and genuine talent for creating their phenomenal music that we all enjoy listening to. 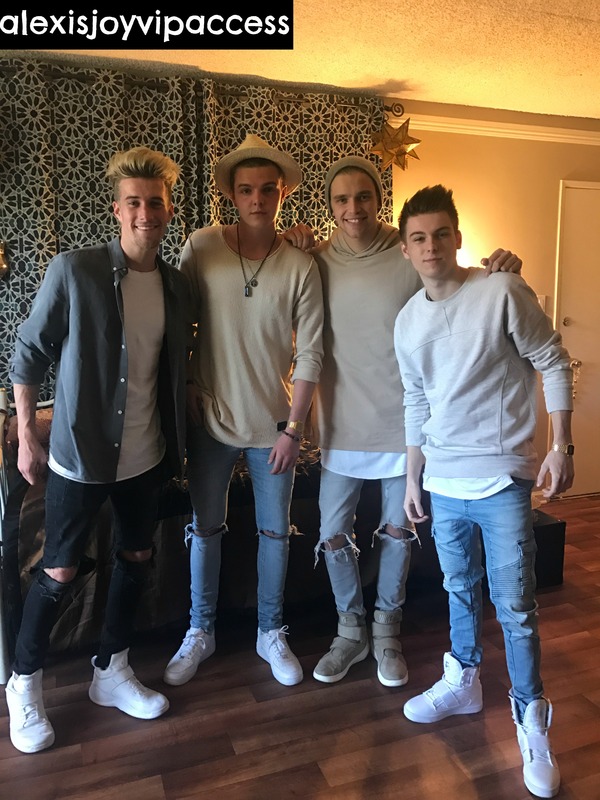 Shane, Jaxon, Kyle, and Sebastian all have their incredible charm, charisma, excellent style, passion, and terrific dedication for what they do and fans can’t help but totally swoon over this remarkable band. State Of Mind started off 2017 in an exceptional way with the release of their awe-inspiring and mesmerizing, new single, “How Did We Get Here.” The song is a massive hit and as soon as it released, fans have been listening to it on constant repeat. In fact, “How Did We Get Here” was even used in the trailer for the highly-acclaimed, fan-favorite show, Tyrant in Belgium – yet another one of State Of Mind’s many stellar accomplishments. Music is a universal language and as for State Of Mind, their music is certainly something that connects fans from all over the world. State Of Mind’s songs allows fans to truly cherish the gift of music, feel the amazing emotions that music brings, and their music has definitely changed the lives of many. Listening to State Of Mind’s music can instantaneously put a smile on your face and brighten up your day like no other. State Of Mind’s success continues to skyrocket and it’s clear to see why with all of the hard work they put into making all of their spectacular musical masterpieces. The boy band is currently in Los Angeles and will be making their way on over to New York as they are working on their much-anticipated debut album. The album will consist of several, magnificent songs that are bound to be chart-toppers and fans will definitely have a difficult time choosing their favorite track as each song will leave you speechless. Jaxon, Kyle, Shane, and Sebastian are all assets to the music world. Every time they perform – whether it is on stage in front of thousands and thousands of fans, at a stop on their school tour, in a radio station, or just anywhere and everywhere, State Of Mind always surpasses everyone’s expectations with their unrivaled and one of a kind talent and fantastic stage presence. These guys work endlessly to bring out nothing but the best for all of their fans and the best is truly what they bring. In addition, all four of them are some of the most down-to-earth guys you’ll ever meet and there is no question about it that they deserve all of their achievements and the many more coming. State Of Mind is already a household name and a musical phenomenon. Get ready because State Of Mind is taking over your heart, your state of mind and the world! I, Alexisjoyvipaccess had a wonderful time catching up with and interviewing the musically-inclined State Of Mind here in Los Angeles and the excellent band and heart-throbs dished exclusively to Alexisjoyvipaccess all about what it has been like for them thus far being in the studio and working on their debut album, what it was like for them having their song, “How Did We Get Here” in the Tyrant Belgium trailer, what the creative process was like working on their song with Flo Rida, and so much more only in our VIPAccessEXCLUSIVE updated interview. State Of Mind even described the feeling they get when they perform for their fans using an emoji and they took on a fun speed round and revealed something that fans may not know about them, who is most likely to be the best dancer of the group and more – hear what they had to say in our VIPAccessEXCLUSIVE updated interview below. Thanks for another super fun interview, State Of Mind – always a blast chatting with you guys! Check out my VIPAccessEXCLUSIVE interview with the stupendous State Of Mind in Los Angeles below! Follow State Of Mind on Twitter: @StateOfMindWrld and on Instagram: @StateOfMindWorld and be sure to get their song “How Did We Get Here” available now on all download and streaming platforms. Be sure to check out the official music video to “How Did We Get Here” below and don’t forget to share it around on all of your social media networks! Previous VIPAccessEXCLUSIVE: The Marvelous Paris Smith Interview With Alexisjoyvipaccess At The 2017 Young Entertainer Awards! Next Article: State Of Mind Takes You Along Their Journey To Los Angeles – Watch Their First Vlog Here!